That was the mega-point size line shouting out at drivers a month ago as we ran the traffic gauntlet on the school run at 0730. Not that I was focusing on any billboards, however large the type and crude the visuals; one has to keep eyes well and truly peeled on traffic at that time in the morning. My 10-year-old son however, peering from the back seat, has been mildly amused and often pointedly acerbic in his running commentary on the party political billboard banter that’s been going on all autumn – certainly well before a date for the dissolution of the current parliament and any election is set. The Partit Laburista (PL) and the incumbent party of government – the Partit Nazzjonalista (PN) – have been waging billboard wars. Their hoardings face each other across roundabouts and crossroads and are strategically positioned opposite T-junctions (with one just across the road from my son’s school exit). We’ve had semaphore signals of the ‘hear no evil, see no evil, speak no evil’ hand and arm-waving of both party leaders; we’ve had own goals (PM Lawrence Gonzi wearing Brazil national footie team colours – don’t ask why! ); and all manner of other ridiculous point-scoring visuals. The parties have engaged communications people par excellence! It wasn’t long after the ‘promise/deliver’ billboard arrived on our roadsides in late November, that our family mulled over the slogan contenders for the political parties’ Christmas campaigns. Deep down, we hoped that they’d have run their course by the festive season and that they’d give the commercial sector a chance to bag some space. We longed for those typical, boring Whisky and jewellery hoardings to go up; but we longed in vain. We knew the parties would be tempted to cash in on Christmas. The party political banter just went on and on, tuning now into a warped festive spirit. 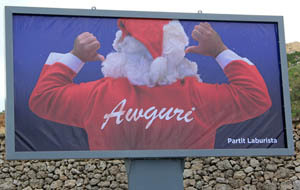 So, now we have our Billboard Santa (PL mocking Gonzi dressing him up, back to us, as St Nich.) 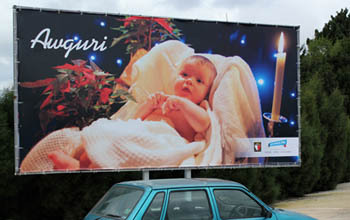 and our Billboard Jesus – the PN, trying to wish us simply ‘Auguri’ (good tidings) by depicting a real baby in mock-up crib garnished by a Poinsettia. The former is just stretching a joke too far, and the latter, well, reminds some of us of Jesus’s last appearance on our billboards at the height of the divorce campaign. My son noted the baby seems to be holding his hands up ‘Gangnam style’! At least that made us laugh for a moment. But seriously, we, formerly known as the gullible audience by the parties, now known (to ourselves at least) as the potential electorate, say enough of the billboard banter and santas. The money wasted all autumn on these campaigns could have been donated in the real spirit of Christmas to charity. My son raised Euro 16 in one hour at his class’s Christmas bring-and-buy stall selling homemade biscuits and buying a few nick-knacks from others. He was so proud of his contribution to L’Istrina, Malta’s major charity fund-raising event whose telethon airs on 26 December. Billboards are around Euro 1,500 a month, I believe, depending on location. On that thought, as we all count the cost of our respective Christmas spends, we wish you ‘Auguri’ from Malta Insideout. While we can’t predict what’s in store in 2013, we know the billboard banter will go on long after Santa is gone. Tonight though, our family is waiting for the impossible – Santa climbing down our stove pipe. Maybe the parties will achieve the impossible next year and surprise us with some intelligent debate pre election.